Aqua’s stylish accommodation is arranged over three levels with panoramic sea views from the top two floors. A TV room, games room, office, and spa/sauna room are found on the ground floor entry level. The first floor is the main entertaining level with an open-plan living, dining, kitchen and TV room forming an L-shape around the terrace and sparkling 18-metre pool. 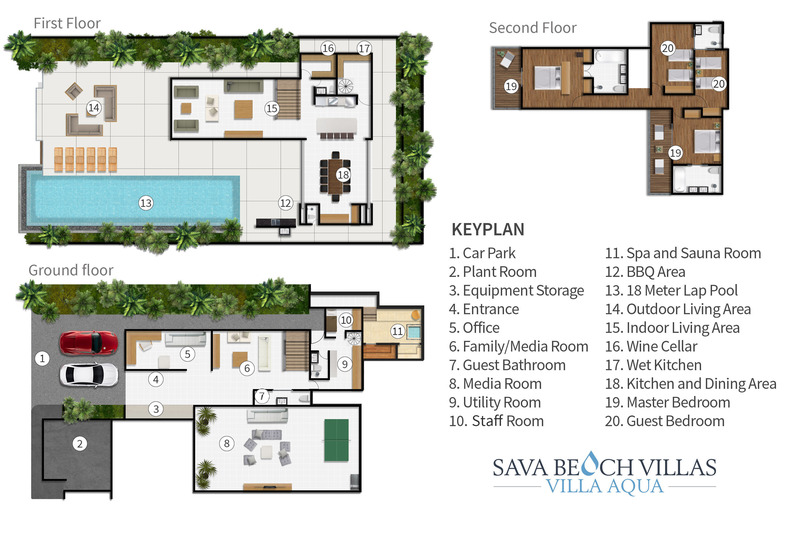 The villa’s four bedrooms, three with sea views, are set on the top floor. Aqua’s two master suites are chic havens of romance fronted with floor-to-ceiling glass and private balconies allowing for blissful ocean views. The vaulted roof adds a sense of grandeur to the rooms, with more lavish touches including walk-through wardrobes, TVs, and ensuite bathrooms with terrazzo soaker tubs. These two colourful bedrooms, connected by a shared bathroom, offer a comfortable retreat for guests of all ages, rooms have the flexibility to convert the twin beds into a king-sized bed. Both of these peak-roofed rooms are furnished with flat-screen TVs, wardrobes and chairs, with one offering sea views and the other overlooking a rural landscape. On Villa Aqua’s first floor the living and dining areas open completely to the generous pool deck to create an expansive entertainment space cooled by the ocean breezes. This open-plan room houses a modern guest kitchen, dining area with a table for eight, a TV corner and a living room in crisp marine tones of blue, green and white. For entertaining in cooler comfort, simply slide the doors shut and switch on the air-con. The ground floor offers multiple options for relaxation and play, with a large games room styled with big vivid paintings and packed with entertainment choices including a big TV and Teatro sound system, table tennis, beanbags, Thai floor cushions and a wine fridge. Near the base of the staircase is a TV room with a sofa and flat-screen TV with sliding glass doors leading to a narrow garden space. Just inside the entrance is an office with a long wooden table and two loveseats. Also on this floor is a spa area with sauna and steam room and a refreshingly cool plunge pool. Aqua’s stylish pool terrace is a dazzling place to gather and unwind. Its 18-metre infinity pool stretches towards the horizon and is framed by a spacious deck with sunbeds, sleek sofas and a barbecue area. There’s plenty of space here to set up the villa’s dining table for alfresco poolside meals. At the back of the villa, the dining area opens to a charming little garden patio with a bench and Elephant Parade statue painted with exotic swirls of colour.